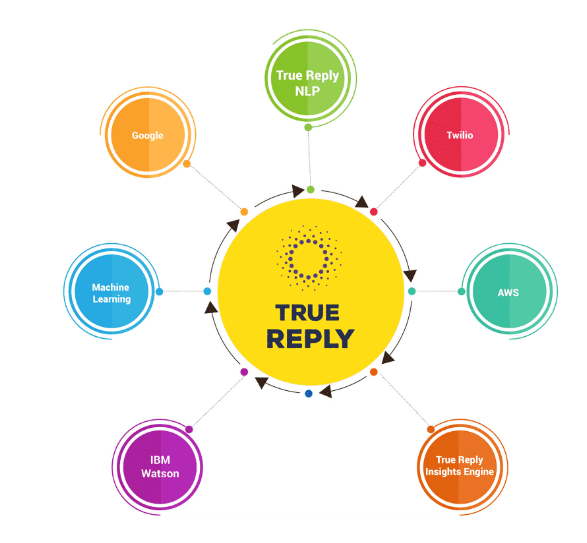 True Reply was originally designed as a testing and training platform for english fluency in telephone based customer support roles.For about eight years, True Reply was a research project in how to analyze voice-based feedback and audio recordings for rating & analysis. We took that research and applied it to the True Reply platform for intelligent, automated voice-based surveying. Today, anyone can configure and launch a survey within minutes via True Reply. Participants can call into a toll-free number or use any Amazon Alexa-powered device to hear questions and provide answers. True Reply takes the responses from participants and creates a fully indexed, open-searchable database that is accessible via a simple user dashboard. Multi-layered insights makes finding relevant data,connections and generating reporting from survey outcomes simple and actionable.Founder, Jose Cotto, witnessed a very real opportunity to make a difference in the lives of patients while helping several non-profit organizations of debilitating diseases. For people living with these conditions, the onset of mid to late stage symptoms can greatly impede their ability to continue participating in clinical trial studies and/or patient registries. He saw an opportunity, through the power of the True Reply platform, to help patients. Now patients are able to continue participating in clinical trial research and patient registries well into the late stages of their conditions. Even after symptoms have progressed to the point where traditional in-person or computer based participation becomes too difficult to maintain, TrueReply surveys are fully accessible via voice. For administrators, being able to positively impact patient attrition and have access to a whole new data class is both empowering and exciting.Continued development and enhancement of the True Reply platform has led us to new opportunities in market research and consumer research. True Reply has evolved to offer call-in cohort surveying, longitudinal surveying on auto-pilot, incentivized surveying and more. In November 2017, True Reply became the first and only platform approved by Amazon to collect consumer feedback via any Amazon Alexa-powered device. This alone exposes True Reply to well over 36 million households. Anyone with an Amazon Echo or similar device can earn money or rewards simply by taking surveys at their discretion and without interrupting other activities. Presently, earnings on the True Reply platform can be cashed out via PayPal. The addition of a Blockchain-based digital currency, however, provides the best opportunity for eliminating fees and streamlining transactions on an already active and functional platform. Web-based UI For Survey AdministrationDesigned from the ground up to be simple and linear. Any researcher or marketing professional can jump in and in minutes have their first survey launched and ready to go! Built To ScaleDesigned to run 100% on the cloud and engineered to take full advantage of server-less computing and cloud-based architecture. Deploy Surveys For Telephone Or Amazon AlexaEasily deploy your surveys to be taken via any telephone or Amazon Alexa-powered device. First Of It’s Kind Amazon Alexa SkillThe first and only platform approved by Amazon for the administration and participation of incentivized surveys via the Amazon Alexa ecosystem of devices. Law Offices of Daniel Ryan, P.C. True Reply Participant Platform Launches. The UI & platform goes live for participants.Anyone with an Amazon Echo or similar device can now register, track rewards, and cash out earnings to PayPal. Platform Updates for Administrators. Survey branching, outbound phone surveying via auto-call of telephone number lists, and enhanced insights (reporting). True Reply Token Integration & Google Home. Integration of TrueCoin to allow administrators to pay with our token and allow participants taking incentivized surveys to earn token.True Reply for Google Home launch. True Reply Mobile App & Exchange Listings. Launch of the True Reply app which allows anyone to browse, track, and participate in incentivized surveys via a customized Amazon Alexa experience. First exchanges to begin listing TrueCoin. Multi-language support & auto-translation Ability to create surveys in English and deploy them in multiple languages. Responses are automatically translated to english. Audio Analysis Engine (AAE). Alpha LaunchEnhanced audio analysis engine enabling emotion, sentiment, and intention profiling. HomeKit & True Reply Reserve Release, 1st. Homekit integration for True Reply on Apple HomePod. First scheduled release of 20 million TrueCoins to supported exchanges. True Reply Reserve Release, 2nd. Second scheduled release of 20 million TrueCoins to supported exchanges.